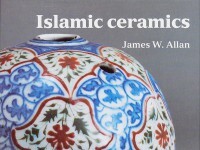 ‘Sgraffito’ comes from the Italian sgraffire, ‘to scratch’, and refers to the technique, common in Islamic pottery, whereby the object is covered with a thin clay slip, and the design is then incised through the slip before the glaze is applied. If, as on this example, the body of the pot is buff, the slip white, and the glaze virtually colourless, the incised lines will appear a buff colour against the white ground. 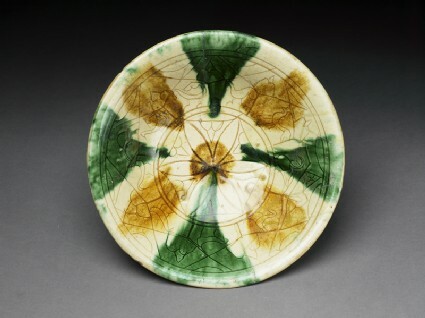 In the centre of this bowl the potter incised a six-petalled rosette within a hexagon. He slightly misjudged the eight-pointed star pattern he had in mind for the sides of the bowl, and drew nine instead: each contains a briefly sketched bird. The coloured splashes, in iron brown and copper green, were perhaps intended to complement the octagon, but end up by creating their own emphases. The result is poorly integrated, and seems to hang together more by chance than design. Such a loose style was, however, very popular in the Islamic world, and the overall effect of the bowl is quite delightful. Sgraffito wares of this type came into fashion in Iraq and Iran in the tenth century. Less demanding artistically and technically than those painted with cobalt blue designs or lustre, they provided the decorative glazed wares for large numbers of less affluent town and village dwellers, and formed a ceramic underworld which continued for centuries.